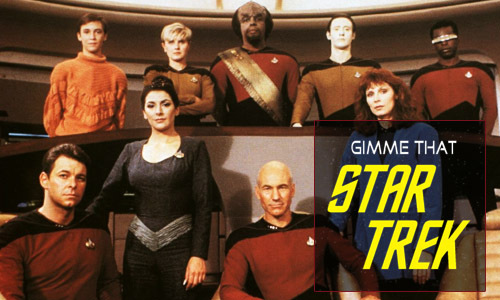 Siskoid goes way overboard again and reviews half of Star Trek: The Next Generation, with guests pitching in with additional material. From Encounter at Farpoint to Devil's Due, buckle in and engage! Listen to Episode 25 by clicking HERE! Or you can right-click “download”, choose “Save Target/Link As”, and select a location on your computer to save the file (135 MB). "Star Trek Theme" by Alexander Courage, with the Irredeemable Shagg on vocals. End theme: "Deep Space Nine Theme" by Dennis McCarthy. Bonus clips from: "Gene Roddenberry Star Trek: The Next Generation Pre Air Interview"; "Star Trek: The Next Generation", starring Patrick Stewart, DeForest Kelley, Denise Crosby, Brent Spiner, Marina Sirtis, Stanley Kamel, Douglas Warhit, Majel Barrett, Gary Armagnac, Karen Montgomery, Carolyn McCormick, Clayton Rohner, Gates MacFadden, Wil Weaton, Robert Schenkkan, Michael Dorn, Jonathan Frakes, Diana Muldaur, William Campbell, William Morgan Sheppard, Whoopi Goldberg, Noble Willingham, Christopher Collins, Barrie Ingham, Rosalyn Landor, Susan Gibney, John de Lancie, Craig Richard Nelson, Jennifer Hetrick, Dwight Schultz, LeVar Burton, Jeremy Kemp, Chad Allen, Suzie Plakson, and Colm Meany; Siri; and Doctor Who's "The Five Doctors", starring Paul Jerricho. Of course. You can tell it's him because he's completely clean-shaven.